It’s not often I am confused about my reaction to a movie or TV show. Ouran High School Host Club has managed to do this to me. In a way I resent it (because not much can stump me) but I also enjoy it (not much can surprise me). I have very scant familiarity with anime or Japanese culture in any form. I have however visited Tokyo and this scrap of insight is useful! I should explain that my confusion probably stems from not knowing exactly how to relate to the humour going on. I wish I grasped Japanese irony a lot better. But it is probably safe to say a lot of “piss-taking”, as we Aussies would know it, is taking place. This inherent playfulness in the show made it instantly endearing. With a vigorous Avril Lavigne-like sound, we are thrust into the poshest highschool the imagination can devise. And in its inner-most gilded walls, the richest, prettiest boys entertain the richest, prettiest girls at tea ceremonies where antique china is idolised as part of the Host Club. A girl, pretending to be a boy in order to attend the school, ends up working for the OHHC because she knocks over a vase. She must repay the boys, which include a self-obsessed and self-declared leader-prince, a “brains” who runs the show, a prodigy and two twins, who only have eyes for… each other! The intense, involved visuals can be overwhelming. There is so much going on. I found myself switching from Japanese with subtitles over to the English sound-track just so I could keep up and not miss signs or pop-ups or other information! It’s also unclear what exactly is meant to be going on with the sexuality of the show. I fear something was lost in the cross-cultural translation. But it is a riotous romp with many zany moments. The show and its characters are also self-aware, tending to think the viewer’s thoughts: for example, this is a love story, we’re the main characters, we’re supposed to fall in love! There is, alas, a fair dose of strobing. 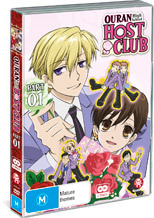 Animation tends to look very great on DVD transfers and Ouran is no exception. It is annoying that the soundtrack is 2.0 (that is, stereo without bass), but this I guess is because it was originally a show on broadcast TV. The extras include out-takes; textless opening and clising songs; and, audio commentary. OHHC is a fantastic, high-camp intro to pulsating, schizophrenic Japanese animation.